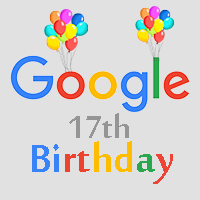 Google celebrates 17th birthday, anniversary, Google began in January 1996 as a research project by (Larry Page) and (Sergey Brin) when they were both "PHD" students at Stanford University in Stanford, California USA. Since the year (1998) when Google launch the first research project and become a business worth named zillions. So Google celebrated this historic day on September 7th, 8th, 4th and 27th dates. Google’s domain name was registered on September 15, 1998 and Sergey Brin filed to incorporate Google on September 4th, 1998. That's why Google officially celebrated birthday on September 27 every year. 2: How to get Google AdSense approval fast. I am in reality happy with article quality and direction. This post is mark on in helpful how some thought apply to any script point. custom essay writing service Thanks a lot for protection enormous things.